During pregnancy, there’s a huge focus on preparing the mother for birth and for life with a newborn. Thankfully, these days, dads are getting a look in too. But despite the brief explainer at antenatal class on ‘preparing for fatherhood’ (which my husband dubbed ‘Secret Men’s Business’ – the guys were asked to leave the group setting and chat for an hour in a separate room) studies show that many men are still feeling unprepared for life as a father. It’s no wonder dads-to-be can feel somewhat ‘left out’ and unsure about their suitability for being a father. The truth is, becoming a father is one of the most bewildering experiences of a man’s life. You may be a capable and efficient high-level executive managing hundreds of middle managers and employees, and yet feel completely incompetent and exposed when cradling your newborn in your arms. Do I feel like I am prepared and equipped to support my wife/partner at home during contractions, and when she goes to the delivery suite? If not, what resources can I read or watch, and who can I talk to? Have we discussed our preferences for how and when medical pain relief is administered (excluding obstetric emergencies)? Am I 100 per cent clear on these so I can be her advocate when necessary, and communicate her wishes clearly with the doctors and midwives? Realistically, do I need a cheat sheet for labour? Perhaps it’s a list with helpful tips and strategies for helping my wife cope with the pain: massage, acupressure, music, heat packs or mantras etc. Have I listened (sat down and given my undivided attention) to my wife’s needs lately? What is she worried about? Does she need me to help her pack her hospital bag, or do practice trips for the fastest hospital route? Does she just need me to hold her and tell her it will all be okay? When the baby arrives, am I ready to experience an intensity of emotion like nothing I’ve ever experienced before? Am ready to lean into vulnerability in that moment, and truly feel, whatever that looks like? The number of ‘macho’ men who admit to crying at their baby’s birth is surprising. Don’t hold back the tears. Have I considered the toll sleep deprivation will take on my work? Do I need to talk to my boss about working from home a few days a week or starting mornings later, to help the transition during the early weeks? Note: If you’re thinking that sleep deprivation may mean being woken occasionally for 10 or so minutes, adjust your expectations… imagine being awake for four hours a night for the first six weeks. If you get more sleep than that, you’re one of the lucky ones! How important is it for me to ‘fix things’? How will I react when my baby has been screaming for three hours (in a way that feels like a bullet through my brain) and nothing – not a bottle, a back rub, a nappy change, extra blankets, no blankets, rocking, a walk outside or waving a rattle in front of her face – will soothe her. What if I can’t ‘fix it’ this time? How will I cope with that reality? What’s the REAL extent of my patience? I’m not talking about how long you can sit in a traffic jam before road raging at the nearest innocent bystander, I’m talking about a bonus reservoir of patience waaaay past ‘the end of your fuse’ that you never knew you had. The kind of exasperated ‘okay, I’ll lie down next to your cot AGAIN’ after trying unsuccessfully 28 times to get your baby to self-soothe. Do I truly understand how much sacrifice is involved in parenting? This question is almost impossible to comprehend before becoming a dad, so instead ask it of yourself during the ninth nappy change in four hours, or after three hours of rocking a screaming baby. Are you up for THAT kind of selflessness and one-way service? Ask yourself, what kind of father do I want to be? It seems a simple question, but for many men it raises a whole host of complicated issues and conflicts. What kind of tone do I want to set for our household? How will I interact with my kids and show them they are a priority for me? How will I treat my wife/their mother? How will I respond to their tantrums? What will I model to them about emotional expression? If you’re feeling brave, ask yourself what your father was like and be truthful, even if it’s not pretty. No parent is perfect, but chances are you’ve picked up some assumptions and instinctive reactions based on the way you were parented. The reality is, some parenting styles help to raise a child who is self-assured and emotionally stable, and other parenting styles produce children who are insecure and afraid of criticism. Later in life they typically self-sabotage their romantic relationships, friends and careers because of a deep lack of worth. If you don’t examine your father’s style of parenting, in the heat of the moment, you’re in danger of unknowingly replicating his actions (however damaging). Or you may find yourself doing the complete opposite because you don’t want to “yell at your kids like your dad did”, and so become a passive, permissive father. On the other hand, your father may have done some great things too. Notice these and carry on the tradition with your own kids. Ask yourself, am I willing to grow as a parent as my child grows? 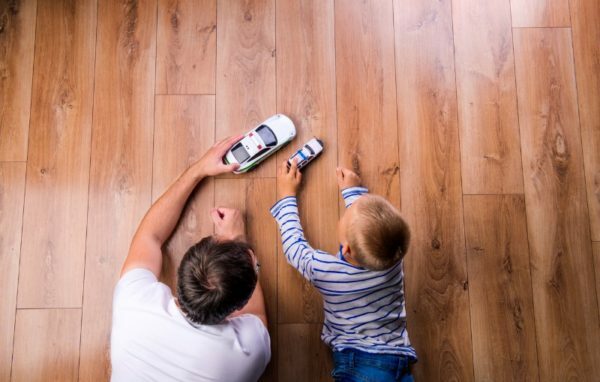 As parents, we are constantly required to adapt as our children test new limits, gain new (sometimes annoying) interests and suddenly develop the ability to defy our rules or preferences. Make an effort to find a way to connect with your child (even if you couldn’t care less about The Octonauts or punk rock) and use these ‘shared-interests’ to create a safe space where they can talk to you about anything. Have you got anything to add? What questions or advice helped you as you were becoming a father?